Through years of developing senior housing properties, Matt Johnson grew frustrated with third-party management companies that were like the “JV squad” of operators. So, in 2015, he co-founded an operating company of his own, Surpass Senior Living. Surpass came out of the gate with five communities in the Phoenix metro area, which opened in quick succession. Today, the Dallas-based company has grown further, with a portfolio of 10 properties. And it is refining its model, which Johnson describes as Marriott buildings at a Hampton Inn price point. Johnson, a principal with the company, shared the Surpass story and plans for future expansion — including in the active adult space — during an interview for Senior Housing News’ new podcast, Transform, sponsored by PointClickCare. Transform will highlight the people and ideas shaping the future of senior living. Johnson was a guest on the first episode of Transform, which focuses on new operating companies that are bringing a fresh approach to the business. Highlights from the interview are below, edited for length and clarity. Subscribe to Transform via Apple Podcasts, SoundCloud or your favorite podcast app. I started McFarlin Group in 2008. 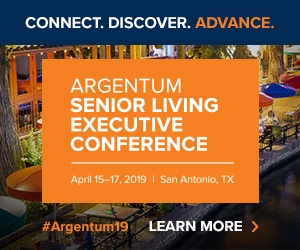 McFarlin was a developer and owner of assisted living and memory care … From 2008 through the present, McFarlin’s been a developer and owner of primarily assisted living and memory care properties, initially just in Texas but now in multiple states. Through that period of time, we utilized third-party operators to manage our properties, and really felt we were getting the junior varsity team, or not the oversight and commitment we were looking for. It was based on those experiences that we started Surpass Senior Living, to manage our own properties. So, we don’t manage for a fee for anyone else. All the properties we manage we have some financial interest in the properties. All those properties have been capitalized, all completed with construction and in various stages of lease up … The fifth is a 202-unit independent living property. So we’ve moved up the continuum a bit from AL and memory care, up to active adult. We have 2 active adult properties under construction, one in the Phoenix market, and it’s about a $45 million property, and another in Raleigh, North Carolina, that’s 187 units of active adult. … On the development side, we’ve really slowed down our development a little bit and have started to focus more on acquisitions in the current market. No. 1, certainly we follow where our capital partners want to go. We’ve got institutions that want to invest with us, so part of our strategy is predicated on where they see opportunities and want to invest their capital. Where we see the opportunities trending is toward acquisition where we can buy for less than we would build for right now. In the last 10 years, we’ve seen construction costs continue to rise, and it seems like they’re at the highest point today that they’ve been since we started the company in 2008. So, we feel it’s still a good time to build in select markets where we can create some barriers to entry, but we are more focused on acquisition of existing properties where we can get them at a substantial discount. We are also in the process of creating a platform to buy non-performing loans within senior living. We have our first non-performing loan under contract that may close in the next 30 to 45 days. So, essentially, we’re buying the loan from the bank and we have a clear pathway to an ownership position, so our basis in the properties is even less than the loan amount. That’s typically for newer properties that we’re focused on there, and geographies are coast to coast. But because of the significant amount of development, our crystal ball of senior living over the near term, two to four years, is that there will be absorption challenges, and a lot of smaller properties that were capitalized with non-institutional money or friends and family, and they don’t have the ability to go back and raise additional capital, we see those properties running into challenges and ultimately turned over to special servicing and banks. So, we are certainly focusing a part of our new business development time on banks and acquiring non-performing loans as well as value-add acquisitions. The initial lease up went well, with just the added time component of … new properties opening up in some of those markets, it started to slow our lease-up and absorption of those properties. But we’re nearing the point of stabilization on at least three of our four properties in the Phoenix market, and we’ll probably look to re-finance or re-capitalize those in the upcoming year. We have found in Arizona, the labor market to be a little better, more friendly, than in Texas and other markets, predominantly because caregivers in Arizona have to be certified. So, by nature of that certification, they have received some formal training and a certificate prior to even accepting a position to us. We’ve found that’s been beneficial. However, with all the new properties, I’d say our biggest challenge and stumbling block has been labor, and finding, keeping and maintaining resident care partners and med techs as our properties continue to grow census. That’s been our biggest challenge in those markets. As we opened three, four properties in a period of 12 months, it was just a lot to handle and onboard. Every time you open a new building, it’s like starting a new business. Hiring all department heads, all line staff, creating a culture, so it’s just a lot of work, and I would say that’s been a stumbling block in just opening four properties in such a condensed period of time in the same market. … Our goal was to develop a property every quarter in Phoenix. For the most part we accomplished that. However, one property is finished a month early, another finishes two months late, so you have this wave of properties almost opening at the same time. So that became the biggest challenge for us, just hiring several hundred people in the Phoenix market all at the same time. And then, certainly, we’re having to re-hire as people leave or we have to terminate. So we’ve hired probably 300 to 400 people in the Phoenix market in terms of new hires and re-hires over the last 24 months. It’s a lot for HR to manage. … Most of the management companies we were working with, and many in the industry, are larger companies [of] 30-40 properties. With scale, comes cost savings and efficiencies. … one of our differentiators, and I’d say our strength, is that we only manage properties that we have an ownership interest in. That aligns us with ownership, with our equity partners, and operations. It allows us to make decisions very quickly and pivot and try new things. So I’d say that’s right now our biggest strength or differentiators. … Some of the new ideas we have tried and are doing are creating our own independent sales consultant program, which kind of competes with A Place for Mom and other third-party referral agencies. Trying to create an army of salespeople, just like Mary Kay Cosmetics or Rodan and Fields, in addition to accessing Medicare data and taking a different approach to targeting third-party referrals in the markets we serve. Our niche is really to be a Marriott building at a Hampton Inn price. Where we see the market is, interest rates increasing and families stressed about mom or dad outliving their assets because of better advanced diagnostics, prescriptions, medicine, better care. So we see in an affordability pyramid, our target is the middle, fat part of the period. We’ve defined that as a Marriott building at a Hampton Inn price point. We try to price ourselves about $200 to $400 less than a majority of the competitors in any market we serve, and we’ve found that’s, for us, been a good market to serve. It’s been well received not only by our investors but also by the families that select us. We’re continuing that Marriott building at Hampton Inn price point on the active adult side as well. Pricing ourselves significantly below traditional IL competitors. It starts with, No. 1, not over-designing the building. We went in and studied some of our first properties we built and looked at what areas of the community were not being utilized, what parts of the community could we combine together, so we really over the last 10 years have refined our footprint first. No. 2, we haven’t worked with architects and contractors who you’ve seen their names in magazines. These are smaller design firms. Really, we’ve worked with one design firm that’s designed all of our buildings, they’re a smaller design firm, they’re cost-conscious, so they don’t overdesign. It feels like when we start value-engineering, you only get 60 cents to 70 cents on the dollar for everything you take out. So we start by designing affordably and conservatively, and then we can always add things in during the course of construction, or prior to financing. So, not overdesigning, and working with smaller, growing firms like ourselves that have solid experience, good people, and can follow the formula and execute on the strategy. That’s allowed us to keep our pricing at a level that’s about 20% to 30% less per square foot, or cost per door, than our competitors. Additionally … a lot of our properties have been single-story, which has allowed us to keep to wood frame construction versus metal stud and eliminate elevators and other things that go along with multi-story construction, so that has helped benefit us in keeping construction costs a little bit lower.